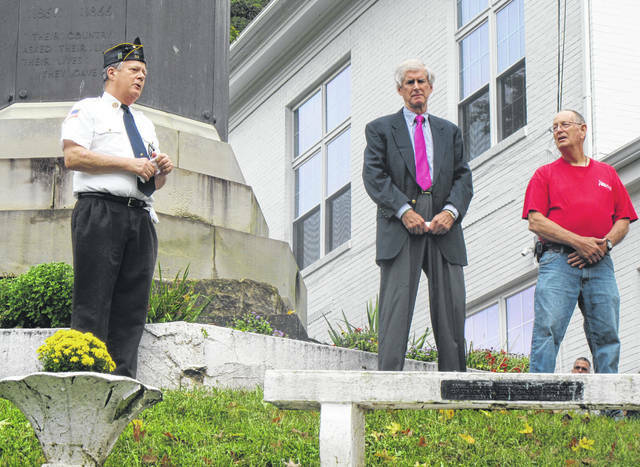 Steve VanMeter (left), Carson Crow (center) and George Korn (right) spoke during the Lifeline of Ohio flag raising on Thursday at the Meigs County Courthouse. Steve VanMeter salutes as the flag is raised. 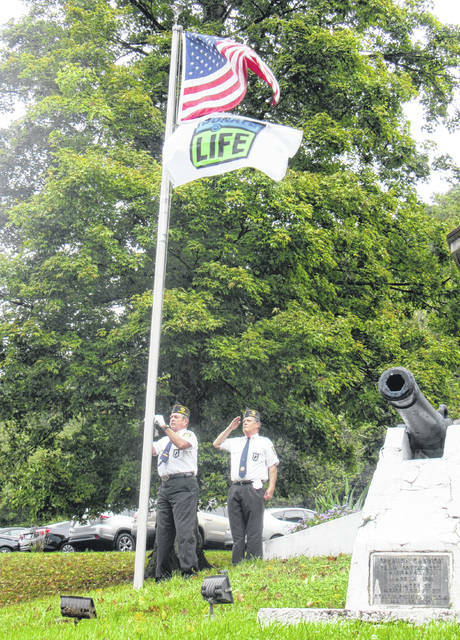 POMEROY — A new flag is on display outside the Meigs County Courthouse reminding residents of the importance of organ donation. A ceremony was held on Thursday with organ transplant recipient Steve VanMeter telling his story, along with George Korn and Judge Carson Crow — both of whom have had family members receive transplants. Jessica Petersen of Lifeline of Ohio also took part in the ceremony. VanMeter told of undergoing a double lung transplant two years ago. “Two years ago I woke up with two brand new lungs,” said VanMeter. He explained that the next day he was sitting up in the chair, then taking a walk the following day. By the third day he was off of oxygen and has not been back on it since. VanMeter expressed his thanks for the donor and her family, his uncle and aunt Howard and Ruthie Parker, the American Legion and all of those who prayed. In the two years since the transplant, VanMeter has had the opportunity to meet the family of his 38-year-old old organ donor with the help of Lifeline Ohio. Petersen said that the family of the donor was the happiest they had been since her passing when they were able to meet VanMeter. “Please consider being an organ donor,” said VanMeter. He explained he had five friends sign up as organ donors after his experience. Crow told of Morgan, his wife’s daughter, who received a liver transplant 16 years ago. Crow credited the power of prayer in helping to make the transplant possible, as there were two people at the same local church praying for two people which allowed for the connection to be made. For Korn, his wife received a heart transplant 24 years ago, and under went a valve replacement a year ago. He explained that the transplant has allowed her to experience many things she would otherwise not have been able to. She is also one of the first heart transplant recipients to live long enough to undergo a valve replacement, said Korn. All of the speakers encouraged the public to register as organ donors and to discuss their wishes with family members. The American Legion, of which VanMeter is a member, took part in the ceremony and flag raising. The flag is now displayed on the flag pole with the Ohio flag, visible to remind of the importance of organ donation. The flag is part of the Flags Across America campaign. According to Lifeline of Ohio, with nearly 115,000 individuals on the national waiting list for a life-saving organ transplant, the need for more registered organ, eye and tissue donors in the U.S. is critical. To raise public awareness about this drastic medical need, Donate Life Ohio is endeavoring to raise a Donate Life flag in each of Ohio’s 88 counties in 2018. By inviting local government offices, schools, hospitals, BMV’s, businesses and organizations to get involved with these local flag-raisings, Donate Life Ohio hopes to encourage the public to stop, pause and consider the difference they can make as a registered organ, eye and tissue donor. About Lifeline of Ohio: An independent, non-profit organization, Lifeline of Ohio promotes and coordinates the donation of human organs and tissue for transplantation. Lifeline of Ohio serves 78 hospitals in 37 counties in Ohio and two in West Virginia and is designated as an organ procurement organization through the Centers for Medicare and Medicaid Services.